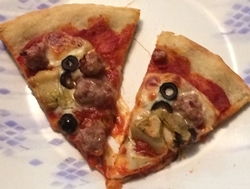 I have been sharing with you my attempts at simplified homemade pizza: weeknight pizza, if you will. It revolved around Trader Joe’s pizza dough and canned pizza sauce. I think I finally have this figured out. Forget the Trader Joe’s pizza dough. Keep the canned pizza sauce. The Trader Joe’s pizza dough sticks to the pan unless I coat it with a thick layer of Crisco. Even then it’s difficult to work with. 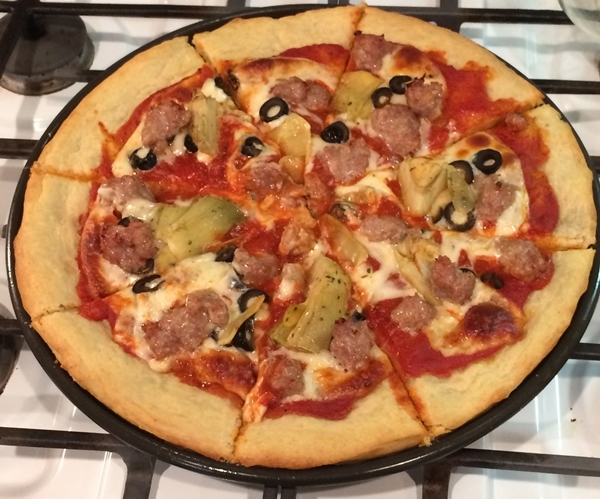 In my latest iteration I made my own pizza dough using a recipe I’ve had for many years. It’s straightforward and not difficult. You just have to plan ahead. I baked the crust for five minutes before adding the toppings. I used half a can of pizza sauce. The real effort and time sink with pizza is when you try to make your own sauce. It worked out really well. I was quite happy. I think I’ve got the formula down for simplified weeknight homemade pizza. Cornmeal on the pan will help to keep the dough from sticking. Doesn’t stick when I make my own dough. It’s easy enough that I don’t need to buy Trader Joe’s.